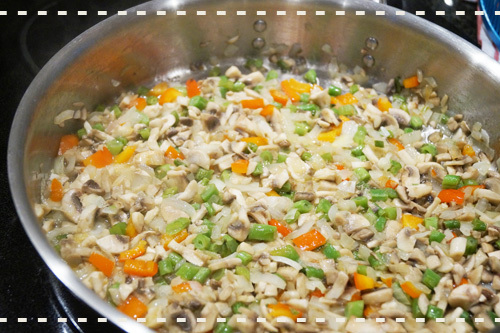 This veggie medley is friendly to different tastes and food preferences and is an excellent choice to use for stuffing. Mushrooms, beans, and red bell peppers blend beautifully in this satisfying and simple dish. It is just the right dish for a quick dinner or lunch so you should definitely try this handy recipe. The ingredients combine well for a terrific taste and fit any budget. This is one of our favorite low-budget healthy recipes. You will appreciate it when you have limited time to make a special meal. Stuff turkey or chicken to add delicious flavor. Remove the stem, core and seeds from the pepper and chop it. Chop the mushrooms and onion. Set aside. Heat the olive oil in a large pan over medium heat. Add the onion and cook, until soft and golden in color, about 7 to 8 minutes. Add the mushrooms, pepper and green beans and continue cooking until the mushrooms have turned golden brown. Remove the cover and cook for 2 to 3 minutes longer, stirring often. Serve in a large bowl as a side dish. What foods to eat on a low carb diet? Is Atkins Diet a "Revolutionary Diet"? Does a low carb diet help if you have Diabetes? How Much Protein Do You Need on a Low Carb Diet? What to Drink when on Low Carb Diet? Subscribe to our FREE Low-Carb Recipe Newsletter and get our Free Low-Carb Recipe eBook. © Copyright Art Branch Inc. 2016 All rights reserved.